One of the UK’s leading suppliers of vehicle and people access control systems, Nortech, has launched a new range of variable message signs (VMS) to add to its range of parking lot counting and availability display products. 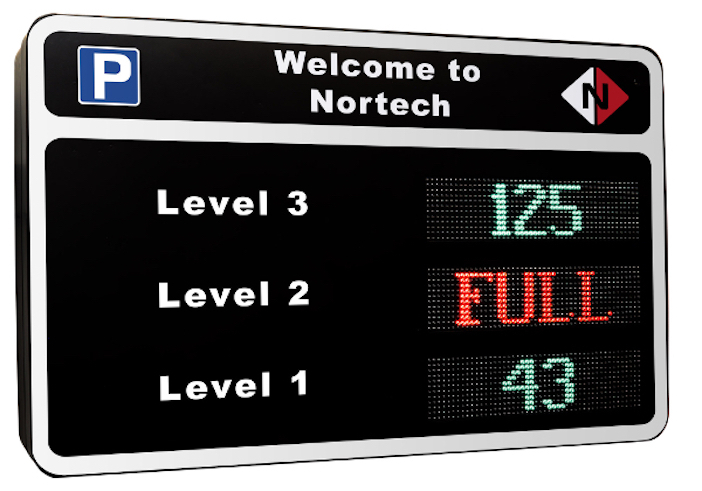 Nortech’s new high-intensity, full color LED signs are fully compliant with the European EN12966 VMS standard, and offers bright, clear messages indicating available spaces and status messages. Contained in a robust weatherproof IP65 aluminum housing, the VMS comes either as a compact, single display sign or as a single/multi-level information sign complete with artwork. The multi-level signs are available with from two to five level counts as standard, with customers specific count levels also available, making them ideal for many applications including highways, hotels, parking lots, corporate offices, airports and hospitals. They can also carry corporate branding as required. Each level display has 4in (10cm) high characters and can be viewed at distances of up to 164ft (50m) with a 30° horizontal viewing angle. The signs have automatic luminance adjustment with the option of manual adjustment to match stable ambient light levels. The high intensity setting is ideal for regions with extremely strong sunlight. The sign can be used in standalone counting solutions with Nortech’s NCT100 counting modules, in full parking count management systems alongside the company’s NCT200 counting modules and NorParc count management software, and for shared occupancy display with Nortech’s shared occupancy controllers (CPC202 and CPC204). The VMS design uses low profile LED matrices, and each sign can display count values of up to five digits with the option to display ‘FULL’ when a count value falls below one. The display options are set via the counting/control module. The settings include the display colors and the options to replace the count value with ‘OPEN’ or ‘SPACE’ when the count value is one or more. Depending upon the application, up to eight individual displays can be connected on a single RS485 bus, each displaying a different count value. All VMS signs come fitted with 16.4ft-long (5m) screened signal cables and power cables. They are also fitted with mounting strips to allow them to be fixed on posts using generic post mounting brackets. A robust wall-mounting kit is also available, enabling the VMS to be securely mounted to a flat surface with tilt adjustment.